If this fly looks weird to you it's because it's dead—covered in the fungus that killed it. It's a very special type of Drosophila—one born and raised in space—and it proves that interplanetary travel could be really bad for the human immune system. So bad that we may end up dead, killed by some stupid infection. Space travel presents unlimited opportunities for exploration and discovery, but requires better understanding of the biological consequences of long-term exposure to spaceflight. Immune function in particular is relevant for space travel. Human immune responses are weakened in space, with increased vulnerability to opportunistic infections and immune-related conditions. In addition, microorganisms can become more virulent in space, causing further challenges to health. To test this, the team lead by UC Davis' Department of Molecular and Cellular Biology researcher Deborah Kimbrell sent flies on a 12-day mission in the Space Shuttle Discovery. 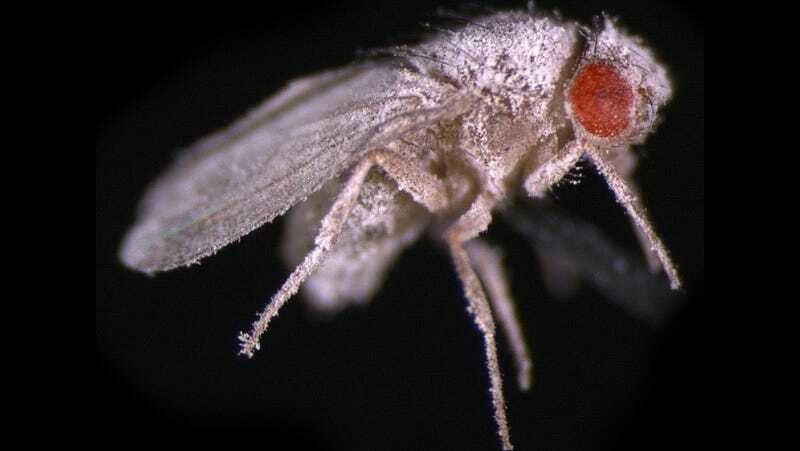 The flies went to space as eggs, hatching 10 days into the mission, and then brought back to Earth. Upon arrival, they subjected the insects to two different pathogens: "a fungus, which flies fight off through a pathway mediated by the Toll receptor, and a bacterial infection that flies resist through a gene called Imd ("immune deficiency")." As they quickly discovered, while their Earthling counterparts maintained their health just fine, the space flies had their traditional resistance against a fungus completely obliterated. They, however, withstood the bacterial infection. Somehow, the microgravity affects the Toll pathway but doesn't affect the immune deficiency gene. On the other hand, they also discovered that hyper gravity improves resistance to the same fungal infections by putting some flies in centrifugal machines similar to those used by astronauts and pilots to test their resistance to acceleration, which effectively increase the force of gravity. According to Kimbrell, this indicates that the centrifugal systems that some engineers envision for interplanetary and interstellar travel could be good not only to "to keep up bone and muscle mass" but for their "beneficial effect on astronauts' immune systems."